Another month has whizzed by and it’s time for another Paper Club. This month is a floral affair with a lovely white larkspur paper and a rose paper, which remind me of a Victorian Christmas. If you’re new here and are wondering what Paper Club is all about, you can read about its origins here. 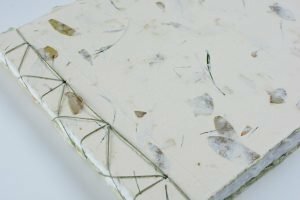 Below is a preview of this month’s selection, which costs $39.99 + free US shipping for six 19″ x 24″ sheets of handmade paper. Please note that I’m not offering the mini packages of paper this month, but they will return in January. If you have any questions, please don’t hesitate to send me an email. And don’t forget to join our super fun Facebook Group: Crafting Handmade Books. To be the first to know about Paper Club, make sure you sign up for my newsletter below.